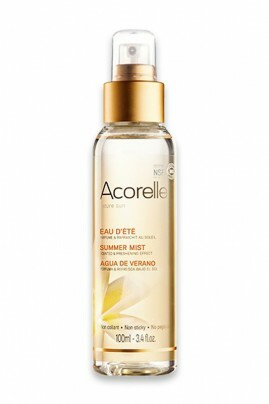 Acorelle Organic Scented Mist leaves on your skin and hair a delicious 100% natural fragrance ! It's safe to use during sun exposure thanks to its non-photosensitizing formula, preventing all risk of sun reaction. Fruit waters concentrated, Acorelle Organic Perfumed Spray smoothes and refreshes your skin anytime. You will love this addictive fragrance which smells like summer on the beach ! Discover this exquisite Summer Fragrance 100% natural ! At any time, spray Acorelle Scented Water on skin and hair for instant getaway on the beach ! INFLAMMABLE. Use and keep away from fire or heat source. Use on clean skin. Avoid contact with eyes and mucous membranes. Do not swallow. Keep out of reach from children. Do not protect against UV rays.